In the beginning of December 2006, Kara miscarried. 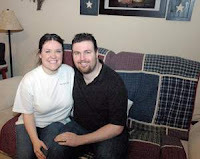 "It was the worst thing that ever happened to us," Kara said on their Web site hopeisheart.org. "I wanted to figure out a way to help because my heart just breaks for people who can't have a child," she said. So, she and Andrew founded "Hope Is ...," a nonprofit agency geared toward supporting couples with infertility or those who have had miscarriages. They also raise funds to help couples seeking to adopt.